The Audi S4 is the high performance variant of Audi's compact executive car A4. 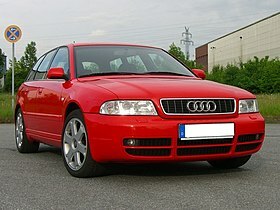 The original Audi S4, built from 1991 until 1994, was a performance-oriented version of Audi's 100 saloon/sedan. All subsequent S4s since 1997 have been based on the Audi A4; and as the A4 has evolved from one generation to the next, so has the S4. A more powerful internal combustion engine, larger upgraded brakes, firmer suspension, larger wheels, and distinctive sheetmetal, styling clues and badging have always been amongst the many upgrades the S4 receives over its mainstream 100 and A4 siblings. In markets where the even higher-performance Audi RS4 is not offered, the S4 is the top-of-the-line trim of the A4 family. Like its regular A4 counterpart, all S4 variants have had longitudinally oriented, front-mounted engines. A single turbocharged 2.2-litre inline five-cylinder powered the original C4 version, and a 2.7-litre twin turbocharged V6 engine was found in the B5 generation. The B6 and B7 versions shared a common 4.2-litre V8 engine, the first time that a V8 engine was placed in a compact executive car, placing it in direct competition with the BMW M3 which at the time had a 3.2 L inline 6. The B8 generation uses a supercharged 3.0-litre V6 TFSI engine and competes with the BMW 335i. The recently introduced B9 generation is powered by a turbocharged 3.0-litre V6 TFSI engine, as opposed to a supercharger like in the previous iteration. All versions of the S4 have their transmission mounted immediately at the rear of the engine in a longitudinal orientation, in the form of a transaxle, and like all Audi "S" cars, are only available as standard with Audi's quattro four-wheel drive (4WD) system, using a Torsen-based centre differential system. All versions of the S4 have been manufactured at Audi's plant in Ingolstadt, Germany; they are, or have been available as a four-door five-seat saloon and a five-door five-seat Avant (Audi's name for an estate car/station wagon) body styles since the model's inception in 1991. 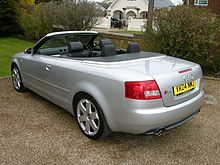 A two-door four-seat Cabriolet (convertible) S4 variant was introduced as part of the B6 and B7 generation A4 lineups. The B8 Cabriolet has now been built off the A5 coupe body style and the "S" variant is marketed under the Audi S5 nameplate. Audi mildly updated the C4-based model line in 1994 and dropped the 100 nomenclature; all variants of the former Audi 100 line were now re-badged as the Audi A6. In line with the switch in model name, Audi temporarily discontinued the use of the S4 name and began selling an updated but fundamentally identical version of the car, based on the "new" A6 and badged as S6. Despite the change in name, differences between the outgoing S4 and incoming S6 were primarily cosmetic. A more powerful, more expensive and more exclusive variant known first as the S4 Plus and later as the S6 Plus was available from October 1992 through to July 1994. Built in very small numbers, the "Plus" models featured numerous performance enhancing upgrades; including the use of Audi's 4.2-litre V8 engine in place of the then current inline-five engine. One of its most renowned owners was Ayrton Senna who owned a silver Avant, not least because he was the Audi distributor for Brazil. In standard form, the powertrain detail of the C4-based S4 was available with only one engine, a single turbocharged and intercooled version of Audi's 2.2-litre 20-valve inline five-cylinder engine This displaced 2,226 cubic centimetres (135.8 cu in) and was equipped with an advanced Bosch Motronic electronic engine control unit (ECU). This engine (parts code prefix: 034, identification code: AAN), developed a motive power output of 169 kilowatts (230 PS; 227 bhp) at 5,900 revolutions per minute (rpm) and 350 newton metres (258 lbf⋅ft) of torque 1,950 rpm. This powerplant made it rather powerful by contemporary standards, and the vehicle with five-speed manual transmission was able to accelerate from standstill to 100 kilometres per hour (62.1 mph) in 6.2 seconds. Both five- and six-speed manual transmissions (parts code prefix: 01E, identification codes: five-speed: CBD, CET, six-speed: CBL, CMG) were offered to European customers, but a five-speed manual was the only transmission available in North America; a four-speed automatic transmission (parts code prefix: 01F, identification code: CBF) was available as an option worldwide. Front and rear axle final drive ratio is either 4.111 or 3.889 (dependent on transmission type), and the rear axle (parts code prefix: 017, identification codes: AAT, AET) uses a driver-selectable electro-pneumatic-mechanical switchable diff lock. Audi's quattro four-wheel-drive system was standard on the C4 S4/S6; a first-generation Torsen-based system which used the "T-1" automatically biasing centre differential (ATB) was used on vehicles equipped with manual transmissions, while a transfer box based system was used on vehicles equipped with an automatic transmission. S4/S6 "Plus" models equipped with a 4.2-litre 206 kilowatts (280 PS; 276 bhp) all-aluminium alloy V8 engine (parts code prefix: 077, identification code: ABH) became available to European customers as an option from October 1992, only with the six-speed manual gearbox, in either saloon or Avant body styles. All C4 S4s' came equipped as standard with a conventional fixed-assistance rack and pinion power assisted steering (PAS) system. An electronically controlled 'servotronic' system, which varied the level of assistance in accordance with the road speed, was available as an option. There were two different types of high performance brake systems on offer for the C4 S4. All S4s' initially had 310 mm (12.20 in) diameter by 25 mm (0.984 in) thick, radially ventilated disc brakes up front, each with an ATE single-piston sliding caliper inside a 'UFO' styled bell-shaped disc. With the introduction of the V8 engine, a new front brake setup became standard; again the discs used radial ventilation, but these front discs were now sized at 314 mm (12.36 in) by 30 mm (1.181 in) - with a conventionally mounted Lucas-Girling caliper in an external position over the disc. US models had smaller 276 mm (10.87 in) discs. The rear brakes, 269 mm (10.59 in) by 20 mm (0.787 in) and also radially ventilated - remained the same throughout C4 production; they used a Lucas-Girling single-piston sliding caliper with an integrated cable-actuated handbrake mechanism. A Bosch three-channel operation (four-channel sensing) Anti-lock Braking System (ABS) with a mechanical load sensing valve for the rear brakes was standard throughout production. The second generation S4 (Type 8D), now correctly titled Audi S4 quattro debuted in 1997, with factory production commencing October 1997, as part of the facelifted B5 platform Audi A4 line-up, although it wasn't available in North America until late 1999. The powertrain details of the B5 S4 feature a 2.7-litre twin-turbo ('biturbo') 90° third-generation V6 engine (parts code prefix: 078, identification codes: AGB, AZB, APB). Details of the powerplant include a cast iron cylinder block with two lightweight aluminium alloy cylinder heads. The valvetrain includes 30 valves (five valves per cylinder), twin hybrid-driven (timing belt and roller chain) double overhead camshafts and variable valve timing for the inlet valves. The intake air is pressurized by two parallel water-cooled BorgWarner K03-series turbochargers; the charged air is cooled by two side-mounted air-to-air intercoolers (SMICs). It displaces 2,671 cubic centimetres (163.0 cu in), and is rated to produce a motive power output of 195 kW (265 PS; 261 bhp) at 5,800 rpm, and generates 400 N⋅m (295 lbf⋅ft) of torque at 1,850 rpm. Engine management was by way of a Bosch Motronic ME 7.1 (7.0 in North America) electronic engine control unit (ECU), and helped it meet the European EU-3D emissions standard. In all US-market cars, the engine was detuned to meet US emissions regulations; output was reduced to 187 kW (254 PS; 251 bhp) and 350 N⋅m (258 lbf⋅ft) (identification code: APB). As in the previous S4, a six-speed C90 manual transmission (parts code prefix: 01E, identification code: DSY, gear ratios: 1st: 3.500, 2nd: 1.889, 3rd: 1.231, 4th: 0.967, 5th: 0.806, 6th: 0.684) was standard equipment, as was the Torsen T-2 quattro permanent all-wheel drive system. Final drive (parts code prefix: 01H, identification code: DQA) ratio is 4.111. A five-speed ZF 5HP19 tiptronic automatic transmission (parts code prefix:01V) became available for the first time as an option. The B5 S4 is fitted with 4-wheel independent suspension. The front suspension is a multi-link design with four individual control arms per wheel. The rear suspension is an unequal length double wishbone design; the lower control arms are mounted to a subframe which also carries the differential housing. Shock absorbers, coil springs, and anti-roll bars are fitted front and rear. The B5 S4 brake system consisted of radially ventilated discs, 321 mm (12.64 in) in diameter by 30 mm (1.18 in) thick up front, and 256 mm (10.08 in) by 22 mm (0.87 in) at the rear. Two-piston Lucas HP2 brake calipers at the front (with four pads per caliper), with Lucas single-piston sliding brake calipers at the rear. A Bosch ABS 5.3 four-channel Anti-lock Braking System (with Electronic Brakeforce Distribution (EBD) and Electronic Differential Lock (EDL) - and later with ESP or Electronic Stability Programme), coupled with a vacuum servo completed the system. A motor racing version of the car achieved great success in the SpeedVision World Challenge with Michael Galati taking the 2001 SpeedVision GT title in a Champion Racing S4, winning four races, and helping Audi to its first Manufacturers' Championship. The Audi Sport specification Champion A4 chassis included a B5 RS4 engine, and Alcon racing brake calipers (4 piston front and 2 piston rear calipers). Don Istook, with Istook's Motorsports, built and campaigned several B5 S4's in first the Motorola Cup, and then the Grand Am Cup. The S4's were even raced by Istook's Motorsports in the Rolex GT category for several races to help fill the field. Of note, one of the S4's, racing against true GT cars, even ran as high as second place (in the rain) at Barber Motorsports Park. These S4's were built using existing S4, not RS4 engines, but used the B5 Audi RS4 K04 turbochargers. The third generation Audi S4 quattro (Typ 8E — saloon: 8E2, Avant: 8E5, and Cabriolet: 8H7) debuted its saloon and Avant bodystyles in Europe in March 2003, and appeared in North America slightly later.[when?] This was based on the latest Volkswagen Group B6 (PL46) platform used by the then current Audi B6 A4. Despite having moved to an entirely new platform, one of the S4's most publicised new features was its new engine - a 4.2-litre V8 engine. 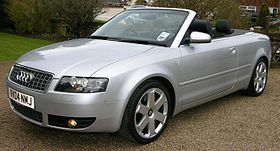 Following its initial launch of either a four-door five-seat saloon (sedan), or a five-door five-seat Avant (estate/wagon), it eventually became available in three bodystyles - and for the first time in the Audi 'S' car range, from February 2004, a two-door four-seat Cabriolet (convertible), Typ 8H, was included in the model range. Official performance figures for standard discipline of sprinting from standstill to 100 km/h (62.1 mph) in the saloon with manual transmission are 5.6 seconds (Avant 5.8 s, Cabriolet 5.9 s), however, a road test conducted by the American automotive magazine Motor Trend indicated that it could go from a standstill to 60 mph (96.6 km/h) in less than 5 seconds, and make it to 200 km/h (124.3 mph) in slightly over 20 seconds, although doing this led to fuel consumption dipping into single digits. This was considerably worse than the earlier V6 models, leading to the addition of a $1,700 gas guzzler tax (combined 20.2 miles per US gallon (11.6 L/100 km; 24.3 mpg‑imp)) for the six-speed manual sedan in the United States. Top speed is electronically limited to 250 km/h (155.3 mph). Replacing the 2.7-litre 'biturbo' V6 engine of the previous generation B5 S4, the new B6 S4 powertrain gained an all-aluminium alloy 4.2-litre, 40 valve (five valves per cylinder) V8 engine (parts code prefix: 079.C, identification code: BBK), with chain-driven double overhead camshafts, roller-finger rocker arm cam followers, and included variable inlet camshaft timing. It also used a strengthened alloy crankshaft bedplate for the five main bearings, and a two-part baffled oil sump, and a light-alloy variable intake manifold (VIM), containing the fractionally sequentially actuated fuel injectors. This petrol engine, based on the unit from the Audi A8, displaces 4,163 cubic centimetres (254.0 cu in), and it produces a motive power output of 253 kW (344 PS; 339 bhp) at 7,000 rpm, and generates torque of 410 N⋅m (302 lbf⋅ft) at 3,500 rpm, making it more potent than the RS2 Avant, and nearly as powerful as the B5 RS4. Engine management was by way of a Bosch Motronic ME 7.1.1 electronic engine control unit (ECU), using a Bosch 'E-Gas' drive by wire electronic throttle, and powering eight individual spark coils with longlife quad-electrode Bosch spark plugs. Ignition timing is a mapped direct ignition, with cylinder-selective knock control with the aid of four knock sensors. The exhaust system includes vacuum-operated valves in the twin rear silencers (mufflers), finished with chrome plated tail-pipes. Like its predecessors, the B6 S4 was standard with a Getrag six-speed (M6S) manual transmission (parts code prefix: 0A3, identification codes: FVD, HEP) (gear ratios - 1st: 3.667, 2nd: 2.050, 3rd: 1.462, 4th: 1.133, 5th: 0.919, 6th: 0.778), with a 240 mm (9.4 in) single plate dry clutch, and Torsen T-2 quattro permanent four-wheel drive system. Final drive (parts code prefix: 01R, identification code: EXZ) ratios are 3.889, giving a top gear road speed to engine revs ratio of 24.4 miles per hour (39.3 km/h) per 1000 rpm. From July 2003, the ZF 6HP19 tiptronic automatic transmission (parts code prefix: 09L, identification codes: GUR, HHU) (ratios - 1st: 4.171, 2nd: 2.340, 3rd: 1.521, 4th: 1.143, 5th: 0.867, 6th: 0.691, with a final drive (identification code: GDF) ratio of 3.539) was included as an option. An unusual sight in the engine compartment was the addition of water cooling for the 190 amp alternator, along with two additional thermostatically-controlled side-mounted radiators. The B6 S4 came equipped with electronically controlled, variable assisted 'servotronic' rack and pinion power assisted steering (PAS) as standard. B6 S4 brakes consisted of radially ventilated disc brakes front and rear. The front discs are sized at 345 mm (13.58 in) in diameter by 30 mm (1.181 in) thick, and are clamped by Continental Teves-ATE FNRG-60 single-piston sliding brake calipers. The rears are 300 mm (11.81 in) by 22 mm (0.866 in), and again use single-piston sliding calipers, with an integrated cable-operated hand brake mechanism. A Bosch ESP 5.7 Electronic Stability Programme system, complete with Anti-lock Braking System (ABS), Electronic Brakeforce Distribution (EBD), Emergency Brake Assist (EBA), Electronic Differential Lock (EDL) and Anti-Slip Regulation (ASR) - also known as traction control system, coupled with a dual-rate tandem vacuum servo provided the brake actuation. Discrete lower door trims, along with the now trademark Audi 'S' model vertical-emphasis line grille, and solid aluminium (later replaced with plastic covered by aluminium) exterior door mirrors, and S4 badging front and rear are all that visually distinguish the S4 from its related A4 brethren. In the interior, front and rear Recaro seats (fronts fully electric with the option of heated seats), standard carbon fiber trims, as well as S4 logos in the instrument panel and door sills complete the detail. The Audi B7 platform Audi S4 quattro, based on the Audi B7 A4, debuted in late 2004. Although Audi classifies it as a new car, the differences between it and the outgoing B6 S4 casually appear to be primarily cosmetic, and is still classified by the internal designation: Typ 8E (although with revised sub-designations - saloon: 8EC, Avant: 8ED, and Cabriolet: 8HE). It has the same 4.2-litre V8 engine (identification code: BBK) as the B6 S4, producing a power output of 253 kW (344 PS; 339 bhp) at 7,000 rpm, and 410 N⋅m (302 lbf⋅ft) torque at 3,500 rpm. There are a few mechanical changes, such as revised springs and dampers and, from model year 2007, an updated Torsen T-3 automatically biasing centre differential, featuring a 'default' asymmetric 40:60 front-rear torque split on manual transmission models, along with the later Bosch ESP 8.0 Electronic Stability Programme and gloss black painted brake calipers. The 'Avus-III' wheels now became an option, and were replaced by a standard offering 8.0Jx18 inch 'S-design' 7-spoke forged alloy wheel. The new trapezoidal single-frame grille, Bi-Xenon high-intensity discharge lamp (HID) headlamps, L-shaped tail-lamps, quad exhaust tail pipes, and discrete V8 badging below the side repeater indicators help distinguish the B7 from the previous B6 model. In June 2005, Audi announced a limited edition run of 250 special edition S4 saloon cars, celebrating 25 years of quattro four wheel drive. This exclusive model was called the Audi S4 25quattro. Available only in the United States, the exterior has unique front and rear bumpers, a carbon fibre boot lip spoiler and lower front splitter, a rear functional red tow hook, and a high gloss Phantom Black painted grille with the "quattro" emblem. 15-spoke DTM alloy wheels, along with optional dealer-fitted 'Audi four-rings' decals for the front doors complete the exterior makeover. Black and grey contrasting interior leathers, along with "quattro" embossed into the Recaro seats, together with a "1 of 250" exclusive quattro gear shift knob for the manual-only gearbox define the interior changes and act as a subtle reminder of the exclusivity that the limited numbers command. On the mechanical side, the S4 25quattro was the second Audi, after the B7 RS4 to be fitted with the latest Torsen T-3 asymmetric ATB centre differential for its quattro permanent four-wheel drive system. Under normal grip conditions, this is set with a default rearwards torque distribution bias of 40:60 front to rear, and a maximum of 100% torque can automatically be apportioned to the rear axle (and up to 80% to the front) as conditions warrant. The final drive ratios are 3.889. From November 2008, the latest generation of the 'Audi S4 quattro' (Typ 8K) entered factory production. It is based on the current Audi B8 A4, built on the Volkswagen Group MLB/MLP platform. Unlike the previous B6 and B7 models, the new B8 version will only be available as a four-door five-seat saloon (sedan), or a five-door five-seat Avant (estate/wagon). The sport-performance two-door four-seat Cabriolet (convertible) mantle is now taken by the current Audi S5 Cabriolet and new Coupe. Unlike previous generations of the S4, only the sedan will be imported to the United States and Canada. Compared to the previous B6/B7 S4 which used a 4.2-litre V8 engine, this latest B8 S4 uses a smaller displacement 3.0-litre TFSI V6 engine, but now with the addition of forced induction via an Eaton mechanical supercharger. The previous B6/B7 S4s were the top-of-the-line models in North America, ahead of the 3.2L V6 and 4-cylinder 2.0T A4s, and competed with the BMW e46 330 and e90 335 respectively. The 3.0 TFSI V6 engine replaces the 3.2-litre FSI V6 as the upgrade engine in the A4 and A6 lineups starting for 2009; both the 3.2-litre FSI and 3.0 TFSI were offered together until the end of the 2010 model year. 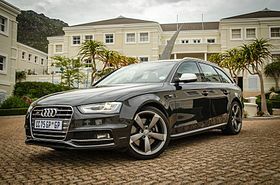 The 3.2L V6 engine is no longer offered in the A4 lineup from the 2011 model year onwards, so the recently introduced B8 S4 is now priced 9% lower than its V8 predecessors, and slots directly above the 4-cylinder 2.0T base model. The S4 now compares more closely with the BMW 335i. At the heart of the B8 S4 powertrain is an all-new, all aluminium-alloy 3.0-litre TFSI Supercharged (TFSI) V6 engine (parts code prefix: 06E, identification code: CAKA), and like the rest of the B8 model range, now with Fuel Stratified Injection (FSI). This petrol engine displaces 2,995 cubic centimetres (182.8 cu in), and it is rated by Audi to a power output of 245 kW (333 PS; 329 bhp) from 5,500 to 7,000 rpm. Torque is rated at 440 N⋅m (325 lbf⋅ft) from 2,900 to 5,300 rpm. This high power output is achieved by using forced induction – and specifically, an all-new Eaton 'Twin Vortices Series' (TVS) Roots-type positive displacement compressor. This new supercharger features twin four-lobe rotors, which are axially twisted 160 degrees. It is mounted on top of the engine, within the 'Vee', pumping air directly into the inlet manifold, and incorporates two separate water-cooled intercoolers. This new design of supercharger is said to reduce the noise, vibration, and harshness (NVH) of the engine. This engine is mated to either a six-speed manual transmission (identification code: KMR) or a seven-speed 'S tronic' DL501 dual clutch transmission (identification code: LHK), the latter with steering wheel mounted paddle-shifters for tiptronic gear selection, which replaces the Tiptronic automatic transmissions found in the B6/B7 iterations. The 'Audi quattro Sports differential' fitted in the rear axle final drive unit is available as an option. Acceleration from a standstill to 100 km/h (62.1 mph) takes 5.1 seconds for the saloon with manual gearbox, the Avant one tenth of a second slower at 5.2 seconds. The same dash to 100 km/h in the saloon with S tronic takes 5.3 seconds, and the Avant at 5.4 seconds. The top speed is electronically limited to 250 km/h (155.3 mph). However, a comparison in the American automotive magazine Road & Track showed the sprint from 0 to 60 mph in only 4.5 seconds for the 6-speed manual transmission. With figures like these, the B8 S4 accelerates more quickly than its V8-engined predecessors. Audi of America claims that the version of the S4 achieves 28 highway miles per gallon, and a 0 to 60 mph (96.6 km/h) acceleration time of 4.9 seconds with the manual transmission and 5.1 seconds with the S tronic. Fuel consumption is rated at a combined 24.2 miles per US gallon (9.7 L/100 km; 29.1 mpg‑imp). Therefore, the B8 S4, unlike the V8-powered B6/7 models, avoids the US gas guzzler tax. The B8 S4's 3.0 TFSI engine also gets only 1 m.p.g. less than the base 2.0 TFSI engine. This is one of the most important reasons for Audi to downsize their engines, while keeping the output equivalent better, by using forced-induction such as supercharging or turbocharging. The same engine is shared with the Audi S5 Cabriolet (though the 7-speed S Tronic is the sole transmission) and the 2013 Audi S5 Coupe. Detuned versions of this engine making 310 hp (231 kW) are found in the 2009-11 Audi A6 3.0 TFSI (C6) mated to a 6-speed TipTronic automatic transmission, the 2012 Audi A6 3.0 TFSI (C7) and 2012 Audi A7 3.0 TFSI, the latter two which are paired with an 8-speed TipTronic automatic. In motor racing, APR Motorsport has currently entered a B8 S4 in the Grand-Am Continental Tire Sports Car Challenge Grand Sport (GS) class. Audi announced the B9 S4 in 2015, with the official unveiling of the European-spec model at the 2015 Frankfurt Motor Show. Noticeable changes to the B9 included a modernised, more angular exterior, newly designed wheels, and a new turbocharged V6 engine. Unlike the pre-facelift B8 S4, the announced European-spec model is only available with an 8-speed torque converter automatic (ZF 8HP55a). Wikimedia Commons has media related to Audi S4. ^ a b c d e Dyer, Ezra (11 March 2010). "Behind the Wheel - 2010 Audi S4 - Less Motor, More Grip, and It All Makes Sense - Review". nytimes.com. Archived from the original on 18 March 2010. Retrieved 21 March 2010. ^ Stephen L. Thompson. "Preview: Audi S4". Car and Driver (March 1992): 79–80. ^ rodrigo gato. "Magnum Force". Car and Driver (April 1992): 47–56. ^ "Senna: aceleramos os carros do campeão". Car and Driver (Portugal). 11 June 2014. Archived from the original on 8 February 2015. Retrieved 9 February 2015. ^ Sport Compact Car magazine 2007 Ultimate Street Car Challenge "The Audi S4 ... showed its capability with consistently strong finishes in the acceleration, dyno, braking and driveability tests"
^ "Sports Car Comparison: 2004 Audi S4 vs. 2003 Mercedes-Benz C32 AMG". Motortrend.com. 26 February 2007. Retrieved 1 October 2010. ^ "2010 Audi S4 - Test drive and new car review - 2010 Audi S4". Cars.about.com. 11 June 2010. Retrieved 1 October 2010. ^ "Four-Door Firepower — page 3 - Comparison Test". RoadandTrack.com. 16 March 2010. Retrieved 22 January 2012. ^ Wiesenfelder, Joe (6 November 2009). "2010 Audi S4 Review by Joe Wiesenfelder". Cars.com. Archived from the original on 5 April 2012. Retrieved 22 January 2012. ^ "2009 BMW 335i vs 2010 Audi S4". Automobile Magazine. 13 November 2009. ^ "The Audi S4". hillsideimports.com. Hillside Imports. 9 August 2014. Retrieved 13 May 2015. ^ PaulTan.org blog B8 Audi S4 Sedan and Avant unveiled! ^ a b "Audi Germany". Audi.de. 29 April 2010. Archived from the original on 26 September 2010. Retrieved 1 October 2010. ^ "2010 Audi S4". Road & Track. ^ "The 2010 Audi S4 is finally here". audisite.com. ^ "2010 Audi S4 Review". automoblog.net. ^ Ulrich, Lawrence (27 December 2009). "A Holiday From Wishful Thinking". The New York Times. ^ "2018 Audi S4: A Thorn In The Side For Much Bigger Cars". www.automoblog.net. Retrieved 10 November 2017. ^ "Review: the 349bhp Audi S4 Avant". www.topgear.com. Retrieved 10 November 2017.